On the second floor, there are three adjoining rooms, with the necessary equipment for meetings and lectures. Modern technical equipment is available for the use of the participants: video projector, an interactive board, loudspeakers, recording console, CD player, microphones, Hi-Fi equipment and Wi-Fi. The Richelieu Room, the site of Landau-Finaly library until the 1930s, has been transformed into a lecture theatre. According to the layout adopted it can accommodate up to 150. The seats have folding tables for note taking. 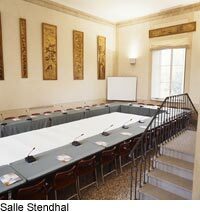 The Stendhal Room, where the paintings were previously displayed, is now a meeting room with a capacity of 48. It was formerly the art gallery of the Finaly family. At present, its tables are set out in a rectangle with room for up to 48. Between the two halls, the Ampere Room is equipped with computers for the use of residents and participants. On the ground floor, the Raphael Room, with a ceiling fresco, overlooks the south garden. It can accommodate working groups of about 20. Decorated with a ceiling fresco representing cherubs, and with 4 large oval paintings on the walls. This room can be accessed through the south garden and the back garden.